The Baruffaldi company was born before 1932, it started producing industrially in 1936-37 and was situated in the east of Milan. 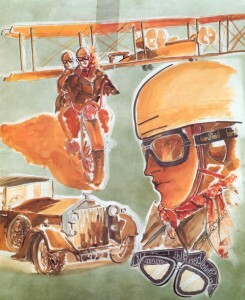 The company was a famous producer of ski glasses, motor and climbing glasses, so important that it began to sponsor “Valanga Azzurra” and “Thoeni”, Nuvolari, Ascari: Baruffaldi became the first ski brand in the world, the second in the moto-goggle sector and the first Italian brand in the branch of security products. – Since 1970, due to competition in the ski sector, risen from technicians who went out, a slow decline started and had its peak in 1997-99 with an irreversible crisis. – Man’ companies followed until the spring of 2000 with different partners as far as an entrepreneur remained with the least turnover, he came from a different sector and was specialised in saving small companies from a shutdown. In September 2000 the company launched a renewed moto-goggle collection which was successful at “Intermot” 2000. – This collection was a mixture of handmade products, improved but more and more expensive, (EPOQUE line), with innovative products, patented, with adjustable nose bridge, interchangeable lenses, interchangeable legs with headband partly industrial, partly produced inside the company by craftsmen and with industrial products designed by the COMPANY AND PRODUCED WITH ITS OWN EQUIPMENTS and moulds as well in the Far East. – The first department dedicated to the development of new glasses is established, with improvements at craftsmanship, with lots of young enthusiastic technicians who take the lead as well the cooperation with other specialised companies for particular external manufactures. In WINDLINE range, Baruffaldi gave rise to an innovative and interesting mixture of leather, foam, metals, CNC aluminium, harmonic steel, patented hinges for lenses and plastics and innovative materials: megol, hytrell, grilamid. – The second collection was launched in September 2001 at EICMA in Milan: from customers in 7 countries to 21 countries world-wide, some with important distributors. At Eicma 2003 in Milan the model two models were introduced – in addition to the improvement in paddings, in leather to better the adherence, in mobile technical bridge – the model MASK equipped with CNC masks, on rolling and interchangeable pivots, unique in Europe, and the model String in aluminium in two versions and interchangeable and photochromatic lenses. At Intermot 2004 the constant and expensive technical improvements have designed the definitive version of Windtini plus with special leg for tight helmets and with an air conveyor allowing helmet ventilation. The leg is interchangeable with one for town use. Unique in the world, this model is equipped with a new aired eye-piece for town (or closed to be used in the desert). Such steady technology development has been applied in our new goggles collection and safety and medical masks, which has been introduced in November 2005 at EICMA in Milan and at AUTOTRON in Holland. At Eicma have been introduced Inty 1 and 2, a very flexible goggle for under integral helmet with interchangeable lenses (also prescription lenses) and in cooperation with a well known company the style SFLY, fitted with MP3, with flash memory 512 and interchangeable lenses, for the sport’s moments, ski and free time. After that goggle some other news will be introduced in the following 18 months, with blue tooth and special temples, created by the research of European specialists. At the present, 70% of our collection includes glasses which allow to wear prescription lenses or optical complements for sight lenses.